First of all, HAPPY HALLOWEEN!! Are you ready for tonight? Are you ready for an entire day of candy? My kids get to wear their costumes to school and the whole school does a parade for all the parents. It’s always fun to see all the different costumes. I had great plans today to share with you a great last minute Halloween recipe, but somehow life happened and it did not. So in the spirit of Halloween and the holidays to come I am hoping to give you a head start, unless it is Halloween then it is too late for a head start, but not too late for last minute ideas. SO I couldn’t resist sharing…it is so true. Because let’s be honest, once Halloween is over doesn’t it seem like everyone skips right to Christmas? But there is an important holiday in between, Thanksgiving. 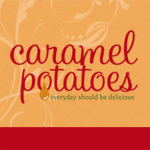 And you know we at Caramel Potatoes, love food giving us a love of Thanksgiving. And don’t forget Black Friday, I think it has become a bigger deal than Thanksgiving. I do love a good Black Friday, I do get really excited about it and look forward to it every year. Now onto the recipes and ideas…. 5 fast ways to say Happy Halloween because every one needs a little last minute inspiration. These Jack-O-Latern Cheese Burger Menu would be super fun for dinner tonight! Don’t forget to roast those pumpkin seeds. And lastly what to do with all that candy that is being collected later this evening? Here are two great ideas: Halloween Candy Bark and Chopped Candy Cookie Bars. We are not skipping over Thanksgiving this year, we have so many great recipes that your family is sure to love! Have so many great recipes, but here is a list of 50 Delicious Thanksgiving Recipes. This list should at least get you started. Don’t forget to set the table with these adorable Cornucopia Place Cards. One of our most popular posts ever is this Thanksgiving Blessing Mix and Printable Gift Tag. There are just so many to share but a few of our favorites, be sure to check out our recipe box for even more great Christmas recipes. Our Christmas breakfast always includes this Sour Cream Apple Coffee Cake. It just wouldn’t be Christmas morning without it. Everyone could use a little Lemon Sugar Hand Scrub in the dry winter months. There really are so many great Christmas Recipes to be found here but a couple of my personal favorites are English Toffee, Thin Mint Cookie Bark, and White Chocolate Peppermint Mousse Pie. Are you hosting a holiday party this year? Don’t forget to check out these great Holiday Party Recipes. Again, I wish you not only a Happy Halloween, but a safe and fun one as well.